Vocational Service is the way Rotary fosters and supports the application of the ideal of service in the pursuit of all vocations. Inherent in the Vocational Service ideal are: Adherence to, and promotion of, the highest ethical standards in all occupations, including faithfulness and fidelity to employers, employees, and associates, fair treatment of them and of competitors, the public, and all those with whom one has any business or professional relationships. The contribution of one's vocational talents to the problems and needs of society. Vocational Services is the banner by which Rotarians recognize the worthiness of all occupations and demonstrates a commitment to high ethical standards in all businesses and professions. Each Rotarian makes a valuable contribution to a better society through their daily activities in business or their chosen profession. The Woonsocket Rotary Vocational Service Award recognizes the dignity of employment and volunteer involvement by honoring the exemplary service of an outstanding individual or business in our community. 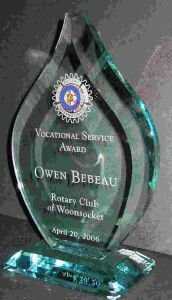 For more information on the Woonsocket Rotary Vocations Service Award, contact Renamarie DiMuccio, Chairperson of the Vocational Service Award Committee at rdimuccio@cox.net.